Sometimes, breakfast gets a bad reputation. We’ve all been told it’s “the most important meal of the day,” but when most of us are rushing around trying to get ready it can be hard to prioritize a balanced breakfast. We’re a big fan of overnight oats at the Pipe Line. They’re easy to prepare the night before and therefore, all you have to do is grab them from the fridge in the morning. There’s no need to cook them at all because the oats absorb the liquid you put in them (though you can microwave them for a bit in the morning just to take the chill out if you prefer)! 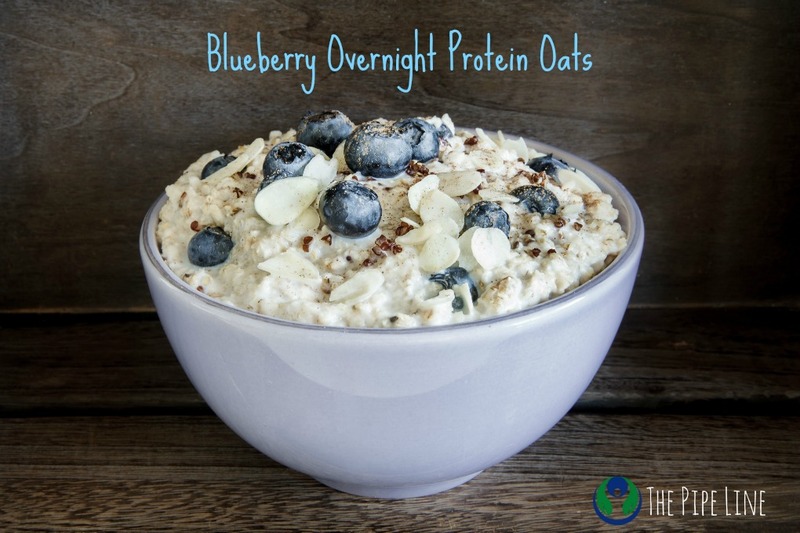 Since July is National Blueberry Month, we thought we’d share our recipe for blueberry protein oats so you can get your day started easily. All it takes is a few minutes the night before! 1. Combine oats, almond milk, protein powder, chia seeds, vanilla extract, and blueberries in a bowl. 2. Place in the refrigerator overnight. 3. In the morning, top it with some honey, chopped almonds, or whatever toppings you prefer. Sweetener can be added to taste. Overnight oats are versatile and can include everything you love about regularly prepared oatmeal, like cinnamon, brown sugar or other fruit! Let us know how you like your oatmeal in the comments, or what your breakfast of choice is!